A hundred million years ago, ichthyosaurs—massive marine reptiles that look like a dolphin mated with a fish—ruled Earth’s oceans. But nearly 30 million years before the extinction of the dinosaurs, these badass predators vanished. It wasn’t an asteroid that killed the ichthyosaurs, so what did? A new study argues that it was climate change. The disappearance of the ichthyosaurs has puzzled paleontologists for years. Last summer, a scientific paper argued that increased competition with other large marine reptiles—including spinosaurus (swimming dinosaurs) and plesiosaurs (long-necked marine reptiles)—pushed the ichthyosaurs species to its demise. But writing in Nature Communications today, Valentin Fischer of the University of Oxford has a different take. Rather than ecological warfare, it was a haywire climate that drove the beasts extinct. 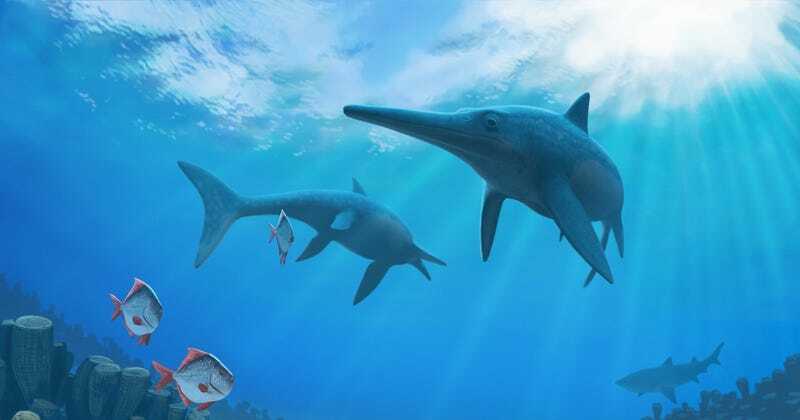 Ichthyosaurs were a diverse group of marine reptiles that evolved some 250 million years ago during the Triassic period, from land reptiles that returned to the sea. In a remarkable case of convergent evolution, ichthyosaurs came to resemble dolphins and whales: They breathed air, gave birth to young, and were probably warm-blooded. In other aspects of their anatomy, ichthyosaurs looked more like fish. They’re an undeniably fascinating group. But perhaps no aspect of the ichthyosaurs’ 160 million-year history is more mysterious than how it ended some 28 million years prior to the asteroid impact that drove 75 percent of all species extinct, marking the Cretaceous–Tertiary boundary. To pinpoint factors that could have killed the group off, Fischer and his co-authors conducted a sweeping analysis of ichthyosaur diversity over its entire evolutionary history, along with a dataset of environmental indicators for past climate change. And the researchers found a striking pattern. Variation in the oxygen-18 isotope—which is associated with fluctuating sea level and global temperatures—is tightly associated with high rates of ichthyosaur extinction. In fact, the researchers pinpointed two distinct bottleneck events beginning 100 million years ago that appear to be related to climate change and, together, seem to have doomed the lineage. It’s possible, the researchers say, that climate change led to a cascade of other problems, reducing ichthyosaur food supply and habitat. The new study represents a small part of a bigger story that’s beginning to emerge regarding the late Cretaceous: widespread “ecological reorganization,” during which many species disappeared and others, including sharks and bony fish, rose to dominance. However dramatic the rise and fall of sea monster dynasties seemed at the time, it wound up being a blip in the history books compared with the apocalypse to come, when a six-mile-wide asteroid plunged into the Yucatan peninsula, igniting volcanoes and spelling disaster for most life on Earth. The End Times of the ichthyosaurs were, as the researchers put it, a “highly peculiar and geologically brief” chapter in the history of our world. Correction 3/9/16: An earlier version of this story cited Nature Climate Change as the journal that published the study. In fact, it was published in Nature Communications. The text has been corrected.